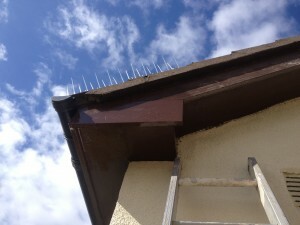 Birds nesting on your premises can cause a significant nuisance. 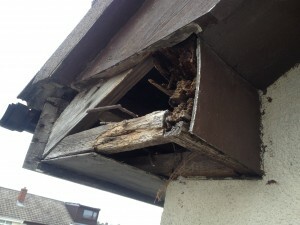 Birds generally nest in attics, gutters, vents, fascia and soffits. Initially you become aware of birds nesting by the amount of noise that they make in for example your attic. This noise can cause real distress to homeowners, waking people early in the morning and keeping children awake in dusk. Although this is a real annoyance for people and impacts on day to day life what is a real concern is the contamination and damage caused by birds nesting. Birds will bring a huge amount of debris to their intended nesting area, often blocking air vents and circulation and creates favourable conditions for fungal attack. Nesting materials and faeces along with the possibility of dead chicks in the nest is not only foul smelling but can also cause a secondary insect infestation. This can present a significant hazard in areas such as an attic, worryingly materials brought into an attic or faeces from the birds can easily find its way into your water tank and in turn pose a serious health risk. Wildlife Management Services can firstly remove the nest and materials. We carefully decontaminate and disinfect the area ensuring it is free from bacteria. We will also repair your roof etc. in order to block future access for birds. Please note this work can only be carried out before birds have laid their eggs or after their chicks have fledged or left the nest, as per the Wildlife Act 1976 as amended 2000. Prior to removing any nests we in Wildlife Management Services will use our specialist video inspection camera in order to be certain of the fact that there are no chicks or eggs present. It is our policy to cause no harm to the birds, chicks or eggs. If your birds are nesting in an open area please read more in our proofing section. Contact us today on 087 6410206 to discuss your particular problem.